Dat fiind importanta „salonului-targ” american, deci a contextului in care se manifesta reprezentantii bedelei din Romania, am deschis acest thread special. The Romanian Cultural Institute in New York is proud to announce their first ever participation as an exhibitor at this year’s New York Comic Con, October 13-16 at the Javits Center in New York. NO SCHOOL: New Romanian Comics will be the premiere presentation at Booth #2018 and represents Romania’s largest comics exhibition in the U.S. to date. Although the comics giants like Marvel and DC steal a lot of thunder, there a great deal of effervescence in comics in Romania. That’s right – Romania the country that spawned not just Dracula but some of the greatest comic geniuses of all time including Will Eisner and Stan Lee [come ooooon!!]. So take a quick jaunt through the behemoths’ 3000-square foot booths, but spend some quality time at the 200-square foot Romanian Cultural Institute’s booth for a fascinating glimpse of what’s happening beyond the U.S. comics world. Three top comics artists who hail from Romania, Sandu Florea, Matei Branea, Alexandru Ciubotariu, along with Milos Jovanovic, the publisher of the cutting edge magazine, Hardcomics, selected the best of the best of Romanian funnies since 1891 to 2011. The artists and publisher will be on hand to present NO SCHOOL as well as to sign their own books. The comics renaissance in Romania is particularly remarkable because of the struggles of the last fifty years. The communist regime forbade comics because it considered them a typical capitalist product. The regime “terminated” cartoonists for drawing “incorrect” characters. Yet, at the same time, the government used comics to indoctrinate children with propaganda. Still, even under censorship, the genre found its niches and developed. The fall of the regime triggered an immediate revival and comics began to thrive and diversify. Romanian comics and street artist Alexandru Ciubotariu is the author of the first street-art album in Romania (Pisica pătrată, Vellant, Bucharest, 2009) – featuring his character of national fame, discretely present (and recognizable) in cities all over the country – as well as of six comic books. Ciubotariu’s work has been published in newspapers and magazines in various countries, and he has participated in numerous international exhibitions and shows. He was awarded over 30 national and international prizes, most of them for comics. He co-edited The History of the Romanian Comics 1891-2010 (Vellant 2010) and is involved in organizing the International Comics Festival in Romania. Ciubotariu’s name is linked also to the first urban-toys and the first website dedicated to comics in Romania (salonbd.ro). Sandu Florea is a veteran Romanian and American comic book artist living in New York. In 1980 he received the Eurocon award for his original comics work in În lumea lui Harap Alb. 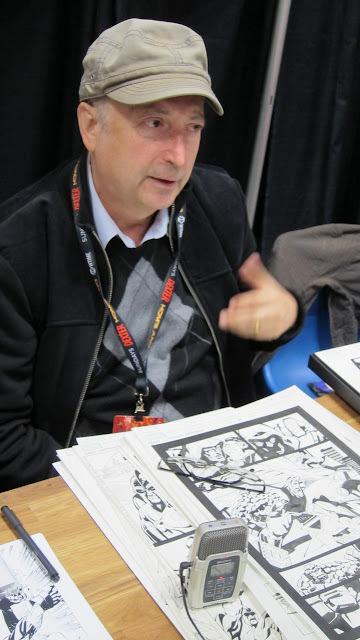 For the past 20 years Florea has developed diverse collaborations with comics magazines and publishers such as Marvel, DC Comics and Dark Horse, created storyboards and other graphics for the motion picture producers Full Moon, as well as book illustrations for The Princeton Review. Specializing as an inker, he is most known for his work on Conan the Barbarian, The Amazing Spider-Man, Avengers, Batman, Elektra, Mighty Thor, Captain America, Dr Strange, and X-Men. Born and based in Bucharest, Matei Branea is a comics and animation artist, the creator of OMULAN, a comics character which became a local hit with the publication of its dedicated Hardcomics issue in 2002, and has enjoyed a robust life in the animated world as well. Branea is a producer of comics, animation and illustration from main stream to underground, from TV shows & advertising to web shorts. He currently teaches animation at the Bucharest Film School (UNATC). Branea is in production phase for a short animated film about Balkan robots and a new OMULAN book. Milos Jovanovic made his first money as an eight-year-old kid selling and swapping comics on the Saturday flea market in his hometown – it was 1980s’ Yugoslavia. Thirty years later he is doing pretty much the same thing, but now living in Bucharest. Since 2002, his majesty runs a small but strong publishing house – Hardcomics, boasting over 30 titles in different forms (books, zines, newspapers) and more than 100 authors, mainly from Romania. He is very good at drawing phallic symbols, particularly in color. He also runs a design studio and speaks more than 6 languages. He was into the Alex Raymond/ The Spirit/ DC/ Marvel thing as a kid, but then went into a Dark Horse/ Crumb/ Shelton phase and ended up at Top Shelfs and Fantagraphics (“USA lovers, I salute you”). The Romanian Cultural Institute in New York (RCINY) aims to promote Romanian culture throughout the U.S. and internationally, and to build sustainable, creative partnerships among American and Romanian cultural organizations. The Institute acts as a catalyst and proponent of initiatives across artistic fields, striving to foster understanding, cultural diplomacy, and scholarly discourse by enriching public perspectives of contemporary Romanian culture. For the past five years, RCINY has been an active enabler and supporter of the presentation and promotion of contemporary arts, urban culture and emerging Romanian artists in the U.S.
Alexandru Ciubotariu, Sandu Florea, Matei Branea and Milos Javonovic are available for interviews either at the show or prior to it. To arrange an interview with them, to speak with a RCINY staffer, to secure a press pass, or for further information, please contact Liz Hartman at moc.l1555884145iamg@1555884145nosdu1555884145HnOna1555884145mtraH1555884145 or 212-580-0868. This blog is going to be mix of things, including action figures and toys, comic books and graphic novels, movies, tv and technology ranging from smartphones and tablets to computers and software. Hai sa zicem ca titlul e la misto, zglobiu, impertinent-amuzant-teribilist etcetcetcetcetc…. Folosirea termenului „apoteoza” inca din deschidere este…apologetic! Prezentarile sunt versiunile in engleza ala prezentarilor cunoscute de noi. Deja, in romaneste, ele sunt inegale, cuprind informatii fara importanta, mai ales pentru comicsloverii americani, intr-un limbaj universal… de lemn. Mai potrivit era ca autorii, cei doi (trei ), Alexandru si Matei, sa se prezinte singuri. Ii multumesc lui Viorel pentru directionarea de pe lumiparalele.ro – paralele, ben trovatto! 😀 – http://www.lumiparalele.ro/2011/10/17/bd-romaneasca-la-york-comic-con/ aici. E aici continuarea pledoariei mele pentru CONSECVENTA. Pe scurt: Just Do IT, fratilor! Apoi bine zici. Daca numarul celor care vorbesc creste, in timp ce al celor care lucreaza scade, in curand vom vorbi tot mai mult despre tot mai putin, pana ajungem la totul despre nimic. Nestled amid booths of ironic gamer t-shirts were irreverent Romanian artists Sandu Florea, Matei Branea, Alexandru Ciubotariu, and publisher Milos Jovanovic, who self publish the only indie comic magazine in Bucharest called „Hardcomics.” Their Rodchenko-meets-Daniel Clowes-style publication is the product of what they call a Romanian „comics renaissance” that resulted from the fall of communism and the de-censoring of comic production. Artist and publisher Matei Branea explains the difficulties of self-publishing comics in Eastern Europe: „At least once a year we succeed in publishing at least one book, which is published usually with our pocket money,” he says. „So we sell some drugs, we do some prostitution, and with the money we save after eating at McDonald’s, we can publish some Romanian comics. Then we sell it almost for nothing and the money goes for condoms.” Hardcomics’s presence at the fair was sponsored by the Romanian Cultural Institute in New York, which two years ago backed their publication of a free newspaper called „Aooleu,” which was given out free at Printed Matter, and also distributed internationally. Cand ironia are atatea fatete implodeaza. Fraze scoase din contextul unei discutii „inalte” bihaindzablox, care insinueaza un fel de pupincuramericanism. As intrepreta aceasta atitudine, sau pozitie, de aparent delirant kissyankassism, in sfarsit, ca una de CONSECVENTA. Asta e linia, subtire, de calcat. Sa renunte la amalgamuri! pana ajungem la totul despre nimic. Îmi permit să vă întreb româneste : care-i problema, frate ? Stilul ireverentios, punk, complet asumat ? Caricatura lejeră a artistului în devenire ? Ok, e o parte de strategie marketing in toată faza asta, dar dacă se poate atrage curiozitatea presei si a publicului american, foarte bine atunci. Nu mă întind la argumente pentru că ramâne, înainte de toate, o initiativă artistică performativă cu toate codurile ei, printre care un anumit sens al imposturii. Si chestia asta mi se pare în teorie destul de sănătoasă pentru a scutura putin din ponoselile etno-culturale de bastină. Scuze, n-am pus diacritice peste tot, se pare că sunt niscaiva probleme de recunoastere a unor caractere. Asumarea completă, sau Consecvența, fara amalgamuri, e cam acelasi lucru, nu? Cred ca nu e nicio problema. Tocmai subliniam asta la Matei. De acord cu teoria, dar nu si cu justificarea imposturii de dragul „scuturarii” incremenirii băștinoase (despre care ma pronuntam metaforic mai sus) folosindu-se, culmea, in promovare, de un limbaj incremenit si el sub furnirul tocit al unor vremi bolnave! Nu operezi cu instrumente ruginite! De fapt, ce conteaza? Pute a necropsie, hahaha! „Publicul”* american este atras de departe de insolitul ROMANIAN. Mai departe… depinde de performarea „baietilor”! Apropo de „standul Hardcomics”: a fost o confuzie. Exista mai multe mese, printre care si o masa de prezentare a editurii Hardcomics – ne-a lamurit Sandu Florea. Vom reveni cu alte informatii si fotografii de la fata si din dosul locului, na! Fotografiile au fost facute de tatal sau, Sandu Florea. Nu poate fi vorba de re-prezentarea Romaniei. Nu este vreun targ international cu pavilioane nationale, de care s-ar ocupa guvernele tarilor respective. In cazul acesta s-a implicat doar o institutie culturala de stat, care a oferit posibilitatea unei noi generatii sa se exprime liber: Doar, doar, s-o-ntampla ceva. Iar zic: este inca o perioada de avant sincronicist formal sub indemnul “Scrieti, baieti, numai scrieti!”, de o disperare implicita si explicabila. *cea a personajului-mascota de pe afis! Documentarea realizatoarei este, ca de obicei, precara – se vorbeste acolo numai de artistul Cristian Neagoe, care nu e, dar il mai stie lumea de la scandalul poneului roz cu zvastica, si nimic despre cei doi desenatori care au facut drumul acolo, dar pe mine m-ar interesa „seria de recenzii pline de elogii” trimise de la I.C.R., pentru ca nu cred ca ar avea cu ce*/cine** sa se laude. Vorba lui Vadim (AM AJUNS SA-L CITEZ!! ): „Nu rupeti gura targului in America, sa stiti…” s.a.
Intre 13 si 16 octombrie, ICR New York a organizat prima expozitie de banda desenata romaneasca in cadrul celui mai important targ de popular culture de pe Coasta de Est (si a doua din SUA) – New York Comic Con. Standul de 18 metri patrati care prezinta istoria atipica a benzilor desenate romanesti, dar si o sinteza a BD-ului contemporan autohton sub titlul NO SCHOOL: New Romanian Comics – prin artistii Sandu Florea (In lumea lui Harap Alb – castigator al prestigiosului Eurocon), Matei Branea (Omulan), Alexandru Ciubotariu (Pisica Patrata) si editorul Milos Jovanović (Hardcomics) – este singurul stand de comics european din manifestarea de la New York. ICR New York continua la New York Comic Con linia sa de programare dedicata graficii si artelor urbane, inceputa in 2008. Singular ca prezenta in randul institutelor culturale din metropola americana, standul expozitiei de la New York Comic Con vine sa consolideze prezenta benzilor desenate romanesti in SUA, oferindu-le artistilor romani o expunere semnificativa in fata publicului de specialitate, intr-un targ de ampla vizibilitate. O cronica zilnica a prezentei romanesti la targul newyorkez, realizata in colaborare cu Cristian Neagoe, e accesibila la http://www.icrny.org/NYComicCon2011 precum si pe pagina de Facebook a ICRNY (http://www.facebook.com/pages/Romanian-Cultura … 4525513962). Pentru o scurta prezentare a NO SCHOOL intrati aici (http://vimeo.com/29481291). New York Comic Con este un targ de benzi desenate, romane grafice, manga, anime, jocuri video, productii de film si televiziune inspirate de benzi desenate – de la mainstream pana la experimental si de nisa. 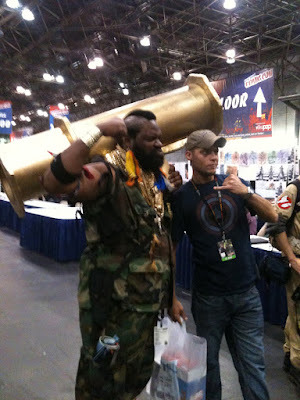 Mai multe informatii pot fi gasite la http://www.newyorkcomiccon.com/ si http://www.facebook.com/newyorkcomiccon. Bucurandu-se de numeroase apariţii in blogurile de specialitate, standul romanesc a impresionat prin calitatea şi ingeniozitatea benzilor desenate expuse. Artiştii romani au realizat contacte cu editori şi jurnalişti americani, deschizandu-se posibilitaţi pentru viitoare colaborari. Unul dintre cei mai cunoscuţi vizitatori ai standului romanesc, Cory Doctorow (boingboing.net) – un guru al blogosferei mondiale – a facut duminica pe blogul sau, care are peste un milion de vizitatori saptamanal, un rezumat a ceea ce a insemnat prezenţa romaneasca la Comic Con: “Don’t miss the Romanian booth for a look at some of the weirdest, coolest comics being made in the world today.” (“Nu rataţi standul romanesc, unde puteţi vedea unele din cele mai ciudate şi cool benzi desenate din lume, la ora asta.”) Mulţi alţi pasionaţi de BD s-au declarat extrem de impresionaţi de faptul ca standul romanesc este “atat de diferit” şi ofera o alternativa inedita la benzile desenate cu super-eroi din mainstreamul american. Prin prezenţa la New York Comic Con, ICR New York a reuşit accesarea şi apropierea unui public american extrem de divers, care in mod normal nu este interesat de oferta institutelor culturale straine din metropola americana. Benzile desenate (…) promovate sunt unele dintre cele mai ciudate si cool care se fac acum in lume, iar standul e atat de diferit fata de benzile desenate mainsteam americane. Asta poate fi viziunea (aeriana, holistica, macroculturala) hulitului Patapievici, care, iata, nu coboara pe dusumeaua saloanelor, muzeelor, conventiilor. Bulbuci aromati intr-un jacuzzi stricat. (…) Aici manifestarile I.C.R. reusesc sa provoace in continuare. Reactiile nu se mai refera la continut (artistic), care nici nu mai conteaza, prin repetarea aceleiasi atitudini de patriotism „cioranian” si de eliberare (defulare) sexuala tarzie, care la vest de noi, in Europa, s-au consumat demult, la un fraged tineret plictisit de scoala si alte canoane…si sunt, cele mai multe, viscerale – ca la noi…! De la ICF (Institutul Cultural Francez), in ICR, sau din lac in put! Pe scurt, cam asta ar fi concluzia mea.